Life as a Lofthouse (Food Blog):Fried Rice was a perfect recipe for fried rice. This recipe will allow you to add what vegetables or meat you would like. It worked perfect for some leftover rice we had in the fridge and made a whole new dinner alongside a chicken dish. The kids approved and next time I make it when Mr.Picky is home I am sure he will as well. The flavor with the sesame oil is spot on and although it seems like a lot of soy sauce the dish is not salty at all. Enjoy this new side dish to all your favorites. If you haven’t tried sweet and sour chicken yet, this is the perfect thing to pair with it. Over medium heat, heat oil and add in carrots, peas, onions, and garlic. Cook until just tender. Reduce heat to low and push vegetables to the side. Pour eggs in the opposite side and fry until scrambled. Add in the rice and soy sauce and mix all together. Posted in Recipes, Vegetables/Sides and tagged carrots, chinese food, COOK, egg, fried rice, green onions, Home, leftover white rice, Leftovers, onions, peas, Pepper, Recipe, Rice, salt, Soy sauce. Bookmark the permalink. Mr.Picky was in need of a rhubarb pie, so I went to my favorite recipe Fresh Rhubarb Pie Recipe – Allrecipes.com. This tastes like a million bucks and always turns out perfect. If you have crust already made it takes maybe 10 minutes to put together. I love the tartness of rhubarb against a flaky crust and a nice scoop of vanilla ice cream. Ice cream is not my favorite but some dessert require ice cream and this is one of them. Rhubarb is one of my favorite vegetables and I can’t wait to try a bunch of new savory recipes I came across. Roll out first pie crust and place in a 9 inch pie plate. Combine sugar and flour, and sprinkle the bottom crust with 1/4 of the mixture. Add the chopped rhubarb and sprinkle evenly with the remaining sugar and flour mixture. Dot the pie with small pieces of butter and cover with top crust. Slice a few 2-3 inch marks on top of crust for steam to escape. Place pie on lowest rack of oven, and bake for 15 minutes. Reduce heat on oven to 350 degrees and continue baking for 40-45 minutes. Serve warm or cold with a small scoop of vanilla ice cream. Posted in Desserts, Recipes and tagged Bake, Butter, Flour, Home, never fail pie crust, pie, pie crust, Recipe, Rhubarb, rhubarb pie, Sugar, sweet and tart, vanilla ice cream. Bookmark the permalink. After coming acoss Perfect chicken tenders recipe | DearCrissy.com they looked so good I needed to try them. Love any new chicken dish I can get my hands on. The family loved these and they could accompany many side dishes. I miss read the directions and over cooked the chicken slightly but will fix that next time. The flavor was wonderful though. Place all ingredients but chicken in a plastic bag, smash-up in bag to mix liquid. Add in the chicken and place in the fridge to marinate for 1 hour. Add liquid and chicken to a skillet over medium heat. Continue to cook until sauce is reduced and brown, about 30 minutes. Make sure they do not burn and stir often. Toss the chicken in any remaining glaze before serving. Posted in Meat/Fish, Recipes and tagged chicken breast, chicken tenders, COOK, easy dinner, Home, honey, Italian dressing, lime juice, main dish, marinade, Meat, Recipe, sticky chicken tenders. Bookmark the permalink. Crock pot Italian chicken turned out so flavorful. Thanks to Hunk of Meat Monday: Crock Pot Italian Chicken I had a quick meal on a busy day. Wasn’t sure what I was going to do with the meat but I quickly put it in the crock pot and left the house. When I returned home, I simple pulled the chicken out and shredded it then returned it to the pot. I then gave my family the option of having it as a sandwich, quesadilla, or atop a salad. We all tried it a different way. I ate it on a salad for three days in a row it was so good. This was not to spicy for the kids because there are no seeds left in the peppers. I am still searching for a substitute for an Italian seasoning package. I hate to use those packets of seasoning. They do taste so good and are quick. Need a healthier option will keep you posted. Sprinkle with seasoning and top with peppers. Add a bit of juice from the pepper jar. Turn the crock pot to low and cook on low for about 8 hours. Around hour 7 you can remove the chicken shred and return to the pot. 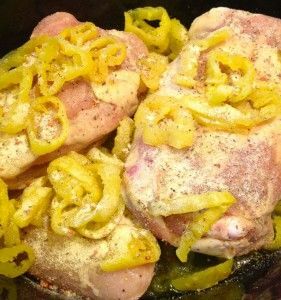 Posted in Crockpot, Meat/Fish, Recipes and tagged banana peppers, chicken breast, COOK, crock pot, Dinner, easy dinner, Home, italian chicken, italian seasoning, mild peppers, quesadilla, Recipe, Salad, Sandwiches, shredded chicken, Slow cooker. Bookmark the permalink. So I was searching in the fridge for something different for breakfast. I came up with plenty of eggs and half a kielbasa sausage. Then I noticed a rolls of crescent rolls, which are usually bought for a purpose and I was surprised to see it in the fridge. This is how I came up with breakfast crescent pizza. Keep in mind anything would really work for your toppings. Scrambled eggs are the base and I would choose some great meat or sautéed vegetables on top. Bake the rectangles according to directions minus 1-2 minutes. Meanwhile scramble eggs, cook or brown meat, and sauté your vegetables. Remove the crescent rolls from the oven. Top with eggs, vegetables, meat, and a bit of grated cheese to lock it all in. Place back in oven for 1-2 more minutes until cheese is melted. I ate mine with salsa on top or some might like ketchup! Posted in Breakfast, Recipes and tagged Bacon, Breakfast, breakfast pizza, Cheese, COOK, crescent rolls, Home, mushrooms, Pizza, Recipe, sausage, Scrambled eggs, Spinach, vegetables. Bookmark the permalink. Came across this recipe from Recipes Straight from the Kowboys Home: “Big Mac” Meatloaf. Big Mac meatloaf sounded right up Mr.Picky’s alley. The recipe turned out nice and moist, not sure about tasting like a big mac. It definitely tasted like a cheeseburger. Cheeseburger meatloaf is not your average meatloaf and was a great change. The technique was really interesting and I am going to run wild with it. I can’t wait to stuff all kinds of fillings into meatloaf. I would serve this as cheeseburgers to company by just slicing and serving on buns. 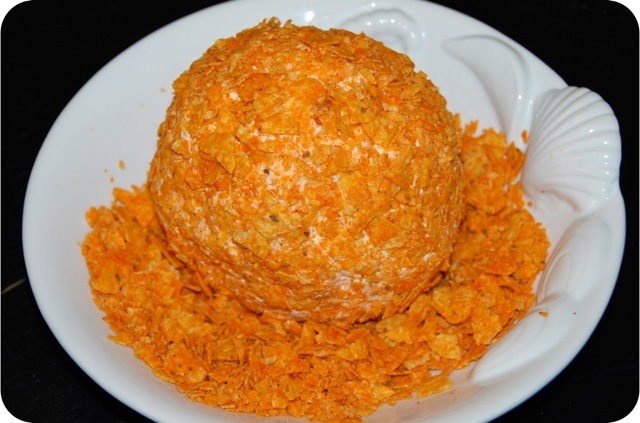 Combine all but the cheese and mix well until evenly combined. Divide the meat mixture in half. Spread each half flat in to a rectangle on a piece of wax paper. Sprinkle the cheese even between the two flat rectangles. Roll each sheet of meat as if making cinnamon rolls, from the long end to long end. Place the rolls side by side in a 9 x 13″ baking dish. Bake 350 degrees for 30 minutes, remove from oven and top with a bit of ketchup and some more cheese if desired. Continue to bake another 15 minutes or so. Posted in Meat/Fish, Recipes, Sandwiches/Burgers and tagged big mac meatloaf, Cheddar cheese, Cheese, cheeseburger, COOK, Dinner, Ground beef, Home, Meatloaf, mig mac, Recipe, stuffed burger, sweet relish, thousand island dressing. Bookmark the permalink.